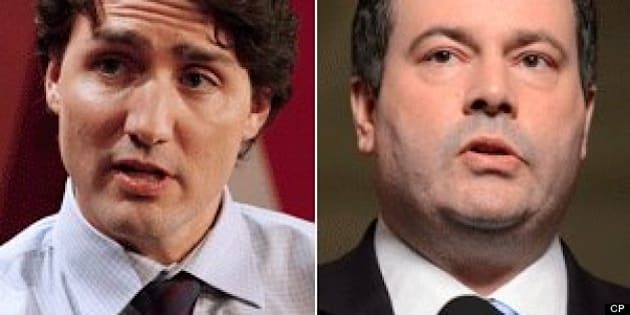 A speech made by former immigration minister Jason Kenney to the Islamic Society of North America (ISNA) has apparently been erased from government websites as Liberal Leader Justin Trudeau faces criticism for his association with the same group. Michael Petrou of Maclean’s revealed on Thursday that text from the former immigration minister’s 2008 speech is no longer available on Kenney’s personal website or the online archives of Citizenship and Immigration Canada. "I’m sure this is due to a simple computer glitch rather than any attempt to re-write the historical record, and that the text of Kenney’s rather lengthy speech will soon be restored to both websites," he wrote, sarcastically. Trudeau was condemned by the Muslim Canadian Congress (MCC) for attending an ISNA event last Friday in Mississauga. The MCC released a statement criticizing the Liberal leader for "endorsing" an organization it says supports polygamy and the introduction of Sharia Law in Canada. "We are deeply disappointed that Justin Trudeau continues to appease known Islamist organisations that not only have a tainted record in the United States, but who are known proponents of Sharia Law in Canada," said Mumtaz Khan, president of the MCC. Newly appointed Immigration Minister Chris Alexandertold The Toronto Sun he didn’t want to criticize Trudeau, but declined a similar request to speak at the event. Unsurprisingly, Sun News host Ezra Levant was quick to jump on Trudeau for what he saw as pandering to Islamists. But it seems Kenney’s speech to the group went largely unnoticed — until now. A cached version of his speaking notes are available online. Kenney told the group he looked forward to beginning "a closer dialogue between the Government of Canada, the Conservative Party of Canada, and the Muslim community in general, ISNA in particular."